Where seen? This large sometimes brightly coloured lizard is commonly seen in our wild places including near mangroves and coastal vegetation. It is active during the day and is arboreal, found in bushes and trees. It is believed to have been introduced to Singapore possibly in the 1980's and has since spread almost everywhere, including in parks and urban areas. It is native to continental Asia up to the northern Peninsular Malaysia. In Singapore, it has displaced the Green crested lizard (Bronchodela cristatella) a native lizard which used to be commonly seen. Features: Total length to 37cm. A stout body with small, bumpy (keeled) scales. It has a spiny crest on the back of its neck and along the body. There are two spines above the ear opening. It has blackish streaks radiating from the eyes. Generally brownish to greenish yellow. What does it eat? It eats insects and even small lizards. Lizard babies: Adult males are larger with swollen cheeks. During the breeding season, males develop an orange head with a black blotch over the cheeks. They display to females and rivals by doing push ups and head bobs. For this reason, they are sometimes called 'Blood-sucking lizards', though of course, they do nothing of the sort. 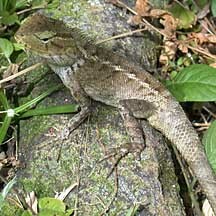 Status and threats: This lizard is not listed among our threatened animals. 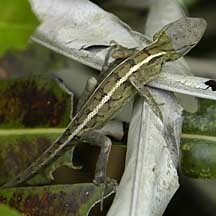 Changeable lizard on Nick Baker's EcologyAsia website: fact sheet with photos. Lim, Kelvin K. P. & Francis L K Lim, 1992. A Guide to the Amphibians and Reptiles of Singapore Singapore Science Centre. 160 pp. Cox, Merel J., Peter Paul van Dijk, Jarujin Nabhitabhata and Kumthorn Thirakhupt. 1998. A Photographic Guide to Snakes and Other Reptiles of Thailand, Peninsular Malaysia and Singapore New Holland. FREE photos of other reptiles. Make your own badge here.